Walter Benjamin, critic, essayist, translator, philosopher - one of the twentieth century’s most influential intellectuals - continues to intrigue today. His work stimulates a profusion of responses in the form of new novels, operas, films and artworks, as well as a never-abating production of academic texts. In this new biography, the first to be written in over a decade, author Esther Leslie uses the recently published entirety of Benjamin's correspondence, drawing on his numerous diaries and autobiographical works, in order to provide a careful account of his circumstances and thoughts. Benjamin had many interests: he cherished childhood and its trappings; had a passion for the displacement and novelty of travel; toys; cities; trick-books; and ships; all are given due attention as the author weaves Benjamin's wayward apperceptions into the narrative of a life lived. She follows Benjamin as he travels from Berlin to Capri, Ibiza, Riga, Moscow, Paris, and finally the Spanish border where he died in 1940. The author acknowledges Benjamin’s thesis that personal histories can be traced only in the context of social milieus, economic forces, technological shifts, and historical events, and seamlessly interweaves biographical details with an accessible yet concentrated account of Benjamin's intellectual development, drawing a colourful portrait of a capacious intellect trapped in increasingly hostile circumstances. 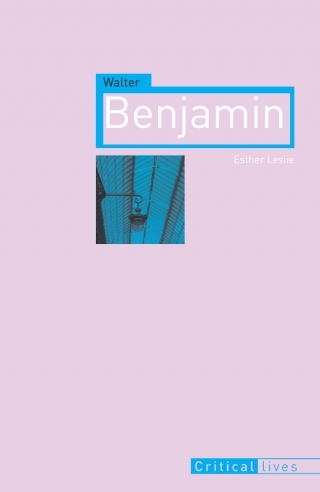 Leslie’s meticulous attention to Benjamin’s political, intellectual, geographical and cultural journeying challenges the populist depiction of the intellectual as a tragic and lonely figure. Walter Benjamin restores its subject to his proper place as an artistic combatant and a man desirous of and relishing experience.